Cleaning is always more time consuming when you have to work around things, so put every away first. In my case, I have individual containers in the bathroom drawers and instead of keeping toothbrushes and toothpaste on the counter, I keep it in a container in the drawer. If you have no other option but to have items out on your counter, try to corral it all in a tray or basket so you can just move 1 tray instead of multiple individual things. If possible, to keep the container clean, line the tray or basket with a handtowel or washcloth, so whenever you change out your towels, you can change out the handtowel as well. I keep a spray bottle of cleaner and a cleaning rag (really cheap washcloths!) under the sink in the bathroom, and something to scrub with (I like coarse cheap scrubbing mitts) in the shower. 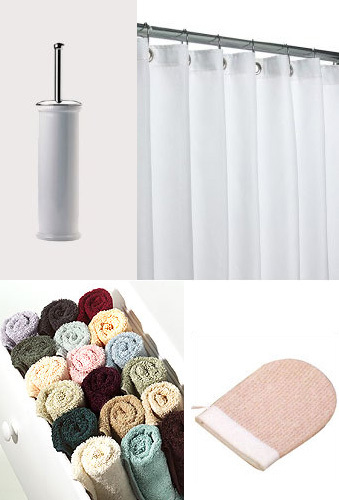 You want 2 of each of these per bathroom so you can swap out easily, and they are always right where you need them. Also, a spray bottle of ShowerShine (or water with vinegar) by the shower. If the items you need to clean aren't conveniently available, it's easy to skip it. Scrub down 1 wall of the shower/tub (I keep a scrubber in the shower and it gets thrown in the wash with the towels), each day moving to the next wall, then do the tub bottom, then all the ledges, the all the fixtures (faucet, drain, etc. ), then all the containers in the shower. Start over again the next week. It takes about 10 seconds and the entire tub is cleaned each week with minimal effort. Take down the window treatments and wash them. The best part about all of this is by "cleaning" for 25 seconds every day and 5 minutes 1-2 times a week the bathroom is always clean and never becomes a "gross" job to do. The once a month stuff actually goes faster on each additional bathroom because a lot of the time is in the setup (finding the bucket, filling it with hot water and soap). The daily and swap out towels things are intended to be very quick and don't have to be completely thorough, because the spot you miss today you can get tomorrow or 3 days from now. My timeframes are all approximate, I do things when they are needed and not on a really rigid schedule, if the floor needs a good washing sooner (especially during the summer) it might only be 2-3 weeks, but during the winter when we aren't outside getting all dirty it might be 5-6 weeks. I hope this helps, the every day quick wipe down/scrub is really the key to all of this. WOW...not even gonna confess what I've never cleaned. I looks like a lot, because I tend to OVER explain everything. But really it's not... and the quick wipe is really my way to be lazy about cleaning, but keep it clean enough so it doesn't get gross, because I HATE cleaning when it gets gross. And my timeframes are just guesstimates of the timeframe I do things on. I just do it when it needs it, but before it gets bad. Really it's all about keeping it clean in a way that doesn't interfere with my hating to clean gene. I love the detail. I am totally going to try this. You and I are so much alike!! I starts at the top and work my way down every day too. When our daily washcloths become worn they move into the cleaning rags. Jen: really it's 25 seconds every day and 5 minutes when I swap out towels that makes it work. So it never feels like you are cleaning. Tamy: now just share your kitchen tips... seriously I need a routine for my kitchen that works as well as the one for my bathrooms. 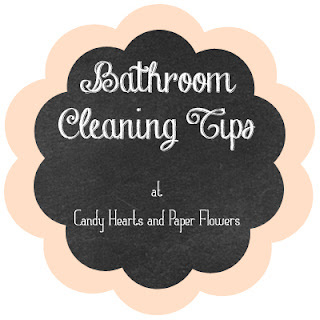 It's very essential to know how to clean bathroom very properly. We should know very easy method to clean our bathroom very fast. Thanks for sharing great info.